No matter what age you are, you need to make sure your life is running at 100% so you can enjoy your lottery prizes for a long time. 1. Being rich will help. Does having wealth make you live longer? Apparently so, according to the University College of London. 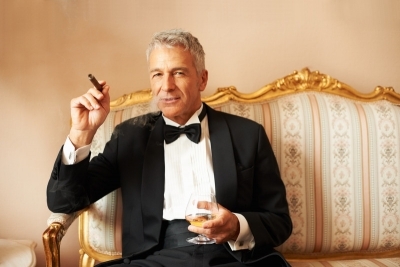 They found that rich people have more DHEAS, a steriod produced naturally by the adrenal glands and brain. It has been linked to a wide range of health benefits including better memory and longevity among men. 2. Live on a Greek island. The home of the largest number of 90 year-olds is on the Greek island of Icaria in the North Agean Sea. They climb mountains and have diets high in olive oil and herbal teas. 3. Floss daily and add years. Regular flossing reduces the chance of heart disease, say doctors at the Department of Peridontics at Case Western Reserve University. 4. Sing your heart out! The exercise from singing has proven to increase health and reduce depression. A study by the George Washington University found that choir group singers felt healthier and had fewer doctor's visits. 5. Own a cat. A cat's purr may actually produce vibrartions at frequencies that help with pain relief, bone and muscle growth. It apparently also heals wounds. 6. Be slightly overweight. For some people, being slightly overweight may be an advantage, according to research carried out at Kaiser Permente in Oregon. A study of 11,326 adults found that in 12 years those who had slight extra weight were 17% less likely to die than people of normal weight. 7. Get angry. It does more good than harm, say researchers at Stockholm University. Males who vent their anger are 50% less likely to die from serious heart disease, or experience a heart attack. And a final advantage for enjoying your money for as long as you can? Housework. Some 200,000 women were studied over 6 years, and those who did moderate housework chores had 30% less breast cancer. The exercise was thought to be a deciding factor. See the full article at Business Insider.